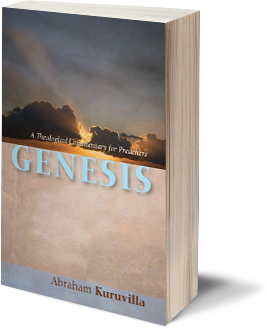 Recently I introduced Genesis: A Theological Commentary for Preachers. Today I want to share an interview with the book’s author, Dr. Abraham Kuruvilla. Abe is Associate Professor of Pastoral Ministries, at Dallas Theological Seminary and has a particular passion for the art and science of preaching. He has served as the President of the Evangelical Homiletics Society and as interim preacher of a number of different churches. Abe blogs regularly at www.homiletix.com. He has also written a commentary on Mark which you can access here and for a more formal statement of Abe’s hermeneutic check out his book Privilege the Text! here. Question: How did Genesis: A Theological Commentary for Preachers come about? Well, I’m on a crusade! I have been engaged in laying out a somewhat new hermeneutic for approaching the biblical text, from a preacher’s point of view. Or maybe I should say, from an application point of view. Language philosophy has now bloomed in the last decade or so and we have come to see better how language and communication—of any sort—should be understood. Biblical authors, like any other authors, do things with what they say. They have an agenda. And it is only by catching the agenda of the author that valid application can be made. The field that looks at what authors do is called pragmatics. And my crusade is to apply pragmatics to biblical texts in order to arrive at valid application. For instance, when A tells B, “Hey, you are standing on my foot!” the semantic meaning (what the author is saying) asserts the spatial location of B upon the lower limb of A, while the pragmatic meaning (what the author is doing with what he is saying) attempts to get B to relocate from that traumatic situation upon A’s anatomy. Now if that statement by A to B (“Hey, you are standing on my foot!”) were an inspired utterance, the preacher expositing that “text” on Sunday morning would conceivably expatiate on the derivation of the word “foot” from the Old English fot from the Latin pes from the Greek pos. He might discourse upon the foot’s kinesiology (26 bones, 33 joints, over 100 muscles, tendons, and ligaments), its hematology (blood vessels and vasculature), and its neurology (nerve supply). The preacher would, no doubt, wax eloquent about the pathology of that extremity (the various abnormalities: club foot, flat foot, athlete’s foot, skew foot, rheumatoid foot, …); and so on, focusing on all the “ologies,” but completely missing the intended valid application of that original utterance: “Take your foot off mine." In other words, unless one catches what A is doing with what he is saying (the pragmatics of the utterance), valid application of A’s utterance is impossible. Of course, all this is critical for the preacher, the one whose goal as intermediary between God’s word and God’s people is, by the power of the Spirit, to provide application possibilities for listeners from Scripture. So, my crusade, in short, is go through every pericope of every book of the Bible, demonstrating, with a close look at the text, what the author is doing with what he is saying in that pericope. Sixty-two more books left. Another 124 years and I’ll be done! Question: Although the subtitle for your book (A Theological Commentary for Preachers) suggests that preachers are your intended audience, who else might benefit from reading this book and why? Preachers, as I mentioned, have the primary task of bringing application to their listeners, and so this (and the others in the series) are written with the preacher in mind. But in actuality, such a hermeneutic, and such a reading of the biblical text, is critical not only preachers, but for anyone who seeks to apply Scripture to life. And, since it all hinges on a close reading of the text in the original languages, some knowledge of Hebrew (and Greek for the NT commentaries) is helpful for using my commentaries, even though I have transliterated and translated every foreign language term that I use. Question: What do you hope to accomplish through this book? Traction for the crusade and getting more students of the Bible (and that includes preachers as well as lay people) to appreciate what the biblical authors are doing. This I think is key if believers are to apply Scripture. If I can get people thinking about looking at the text this way, I’ll label my crusade a success. Frequently, especially for narrative, we view the text as a plain glass window through which we look to see what really happened. I am claiming that “what really happened” is not inspired and profitable for doctrine, reproof, correction …. Rather what is inspired is the Holy Spirit’s account of what happened. In other words, this theological hermeneutic that I propound calls for readers not to see the text as a plain glass window through which they look, but as a stained glass window at which they look. The colors, shapes, lead, mercury, etc., are doing something—they are telling a story. So also the text: its literary properties must be appreciated, its structure must be respected—the text itself must be privileged. Question: As you know there is considerable discussion today related to creation and Genesis 1–2. Could you offer a few suggestions on how preachers might best navigate these texts? My recommendation would be to look at the text (any text of the Bible) not as a manual of information but as a guide for transformation—of our lives and the lives of all believers. That being said, because of the controversies related to Gen 1-3, I have several excursuses related to the key issues therein, that I think might be useful to readers. And I have listed some outside resources in those sections. Question: Other than your book, what are some other resources that might help those who are interested in preaching or teaching Genesis? The ones I interacted the most with are commentaries on Genesis by Cassuto, Cotter, Fokkelman, Hamilton, Kass, Mathews, Waltke, Walton, and Wenham. Great stuff! I stand on their shoulders with humility and gratitude.